Let your voice be heard regarding keeping the phrase One Nation Under God in our Pledge. 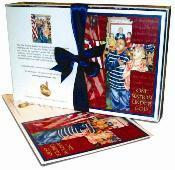 These beautiful note cards tell the pledge story with a strong message. Packaged set of 12 Note Cards with envelopes featuring Marnie's One Nation Under God painting. These cards are printed on the highest quality cardstock and are nicely packaged for a beautiful presentation. They make great gifts.